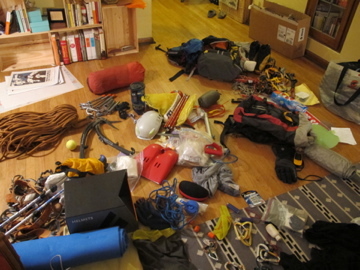 As I was sorting out my equipment last night for an upcoming climbing course in the Cascades, I realized that the packing process and the items that go into my pack are a topic that I should talk about more. In this case, I’m going to be doing two technical climbs on Mt. Baker over the course of three days. We’re planning on climbing the North Ridge (III, 70 degree ice, 3000′ gain) one day and the Coleman Headwall (IV, 60 degree ice, 3000′ gain) the following day; our alternate route plans include the Cosley-Houston route (III+, WI4, 1500′ gain) on the north face of Colfax Peak, a sub-summit of Baker, which is more technical and requires waterfall ice climbing and the Roman Mustache – Pencil Thin (III, 60 degrees, 2000′ gain). All of this means that we need to pack equipment that is both light and versatile for the climbing and weather conditions that we will experience. This trip requires carrying a light load on the approach as to not tire us for the two long days ahead. Given the coming weather forecast that is calling for reasonable June weather (mostly sunny days and moderate evening temps), I tailored my clothing and sleeping system to this end. Out went my heavier eVent jacket and in went my lightest shell jacket and pants. There are three pairs of gloves in the pile somewhere, because gloves just don’t dry out in the Cascades this time of year and I want dry gloves each morning. There are two pair of socks too since I want dry socks each morning and don’t particularly want to rely on drying out my wet pair each night in my sleeping bag. 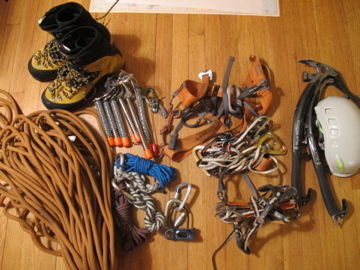 Our climbing equipment is also customized given the snow and ice conditions of this season. We had a great winter last year and still have a lot more snow than is normal this time of year. This means less exposed ice and more snow. This translates into more protection for snow (pickets/axes) than ice screws. 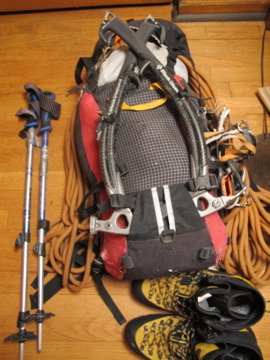 It also means that I can carry lighter crampons since I only expect to climb a couple real pitches of hard ice. I did bring two technical ice tools since I’ll move faster with two tools on the ice pitches instead of an ice axe and a technical tool like I take most seasons. Of course, I want to pack all of this in a logical order. I’ll delve into my packing system in another post in the future, but for now let’s say that I want it to be packed deliberately. I want things to be packed in the reverse order of the way that I’m going to use them. 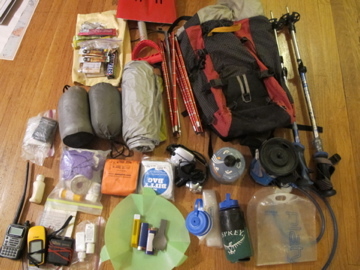 My shell jacket is on top, then my harness, then my gloves (my hands stay warm), then camping/sleeping stuff in the bottom. The lid, or brains, of my pack has the navigation gear, 16oz water bottle, sunscreen, and some snacks…and the camera when the weather is too bad for it to be around my neck.